In this post, Gemma explains how she balanced her studies with performing arts to get three Band 6 results. Gemma balanced her passion for performance with a dedication to study to score Band 6 in 3 of her subjects. 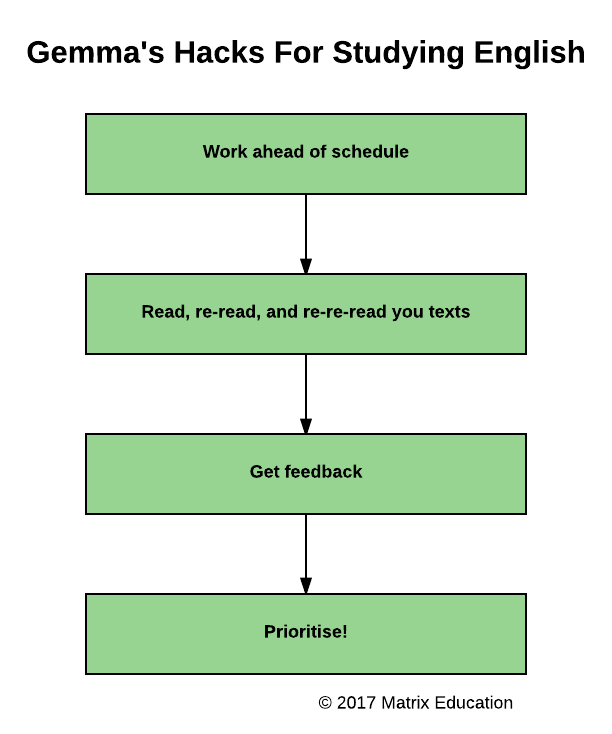 In this post, we share Gemma’s hacks for HSC English students. My name is Gemma Nha, and I graduated from The McDonald College in North Strathfield. I feel like my entire life has been a juggle of academics and performing arts, and I was lucky enough to attend a school at which I was able to receive a strong academic schooling and balance it with a high level of performing arts training. As much as I would love to pursue a career in law, my heart lies with music and musical theatre, and I am fortunate to have been accepted into the Sydney Conservatorium of Music for a Bachelor of Music (Performance) majoring in classical voice. The main point when studying any subject is to study effectively. It is much healthier and easier on the brain to study in short bursts with a high level of concentration, than to study for long hours with half your mind on parametric equations and the other half on whether Justin Bieber and Selena Gomez are back together. English was definitely the most difficult subject for me, despite my high rankings and marks. While I excelled in comprehension, essay writing was a bit of a pain and creative writing was my weakest point. The only way I maximised my marks and climbed up the ranks was by spending time working on English (as much as I dreaded it). It wasn’t like Mathematics, which I worked on daily, but it was ensuring that I put in the work to reap the bountiful harvest. Find out what your prescribed texts are and start reading them, first for leisure, then with a pencil and sticky notes, and then with further analysis. Find online notes for your texts – unless your school was like my school and did slightly uncommon texts, there should be plenty of online resources. Also, ask previous years what kind of assessments were given, and if they had any copies of their own essays. There is no harm in being prepared and asking for help, which is what I realised over the course of years 11 and 12. Most people aren’t mean enough to refuse to give you their notes, particularly if they’ve already graduated. BUT make sure you’re asking the right people. Step 2: Read, and re-read, and re-re-read your texts! You will meet people who say “I never read my HSC texts.” That’s a lie. And if they actually didn’t, chances are, their marks weren’t that great. I only know of one person who only read sections of our prescribed texts and proceeded to come first internally. She was a special case. Everyone else I know who didn’t read their prescribed texts came in something like the bottom 10 ranks. There is a certain level of fresh understanding that comes each time you read a text – it’s like how you can only improve your stage presence as you increase the number of times you perform to an audience. And if you compare the answer of someone who read their text 5 times to someone who skimmed through the text once, whose answer is going to be more in-depth, sophisticated and comprehensive? The teachers at our school were very lenient and would accept our draft assessments, creatives and essays for feedback. I understand that most teachers don’t allow that, but there are ways to work around this issue. Ask a past student who did well in English. Ask your Matrix teachers and tutors for a professional opinion. Ask your family – if they don’t understand it then you’ll need to adjust it so that they can. Maybe even ask a friend who’s teacher will mark it. It is important to get feedback so that you can improve your writing style and technique. You will know based on your marks and personal interest what parts of English you are good at and what you’re not. I was best at comprehension – I received full marks for every comprehension task we did. But I wasn’t so good at creative writing because of a lack of sophisticated vocabulary, and my essays were only slightly above average. So, I split the time I spent on English, prioritising brainstorms and vocab work for creative writing, then spending time on perfecting my essay theses, and if I had spare time, I’d work on comprehension. My peers would always ask me, “Why do you dislike English so much when your marks and ranks are so good?” Initially, I didn’t know the answer either, but then I realised it was because I was spending so many dreaded hours trying to perfect my essays and my creative writings. If you work hard, if you give your 100% commitment, there’s no way you can’t excel. At the end of year 11, I logged in to our school’s Moodle and downloaded the previous year’s assessment notifications for English. I read through what each assessment encompassed, and worked on my texts based on what the assessments would need. Though the questions asked for each assessment wouldn’t be exactly the same, I knew that I would need to prepare a powerpoint for AoS, three essays for Mod A, a podcast for Mod B, and practice viewing tasks for Mod C.
By being prepared, when we actually got the assessment tasks, I had a head start because I had asked the top students of the previous year for their assessments, and I already knew what was coming. Thus, I was a little less stressed out than some of my peers and could focus whole-hearted and whole-minded on the task at hand. With the take-home tasks, I would do bit by bit daily and try to finish it within the week so that I wouldn’t have to worry about it, and also so that I could send in drafts to my teacher and receive feedback. That way, the final copy would be written to perfection. The comprehension work I did in class was sufficient preparation for that aspect of Paper 1. However, the effectiveness of that will depend on the person and their strengths. With regards to my creative writing, while my teacher suggested at least 3 creatives in preparation, I had one that I could fit with any line of the rubric. I think this was more effective because as much as it is good to practice writing and prepare heaps, it is easier to memorise one creative that can easily be adjusted to cover multiple aspects of the rubric. I prepared for my discovery essay by listing multiple techniques, points and quotes, forming body paragraphs with 3-4 of the points, and then memorising the rest, in case I needed them in the exam. I also prepared two related texts, unlike many other people in my class, so that I had a range of choices. So while I was giving up two creatives, I was balancing it out by analysing more related texts. Paper 2 was definitely much more difficult than Paper 1 in regards to preparation. There was a lot of back and forth emailing between my teacher and me so that I could prepare the best possible essays for Mod A, B and C. I spent time leading up to the Trials re-reading my texts, looking through past assessments to see what I was good at and what I needed work on, and researching anything and everything I could find on my prescribed texts and the authors. For Module A, I studied the Intertextual Perspectives between Niccolò Machiavelli’s The Prince and William Shakespeare’s Julius Caesar. This was by far the hardest essay to prepare for, and I spent hours researching the contextual details of Machiavelli and Shakespeare, flicking through my Matrix textbook and discussing the content and context with my peers and teacher. Discussion has been the most help to me over the course of the HSC, because you learn to convey your points in a clear, concise way, and by agreeing and challenging other students’ opinions, you can gain a heightened understanding of the text with new ideas that you can incorporate into your essay. My Module B text was Tim Winton’s novel Cloudstreet, and I prepared for this essay by taking personal responses of previous students and combining them with my own to create an extensive personal response. For Module C, I studied Rolf de Heer’s Aboriginal film Ten Canoes, and in preparation, I looked up the Aboriginal tribe in the film and watched a documentary of the behind-the-scenes and de Heer’s thought process in making the film. This approach gave me a deeper understanding of why he chose the form of a film, and the message he was trying to portray. I felt the preparation for the HSC English Exam was much simpler and easier than that of the Trials. By this stage, I had read and watched my texts sufficient times to be able to write detailed and sophisticated essays. Instead of reviewing my texts as I did for the Trial, I used the time leading up to the HSC exam by going through my Trial exam, seeing what I needed work on and sitting at my desk to make the essays better. Most of the study in preparation for the HSC is a matter of improvement: you look back at the work you’ve done earlier in the year and see how you can make that essay more concise, how to make it look informative, how to make the creative sound exciting. If you can improve from every assessment, the final essays and creatives for the HSC should be almost perfect. If I could repeat this year, I really want to take my own advice in working effectively. I studied long hours, concentrated hard, never went out – my life revolved around studying. But I wish I had taken time to relax as well. Music was definitely an escape, but since Music 2 was one of my subjects, even doing music felt like work and stressed me out. If I could repeat the year, I would give myself the leisure of doing something fun once in a while (obviously not every weekend) so that I’d be able to clear my head and work even more effectively, thus maintaining my health as well as improving my academics and preparation for the HSC. It’s a short year, it goes by in a flash. But even still, a year is a long time, and you have to maintain your stamina and health. Don’t stay up till 3 in the morning studying, only to wake up again at 7 to go to school – you’re not doing yourself any good. Have a routine. Only you know the minimum hours you need to sleep in order to function, so make a schedule around those hours and get into a routine. Sickness is your worst enemy – if you’re sick, you miss out on school, you have no motivation and you fall behind. So, maintain your health and stamina. Exercise, go for walks with your friends – use this time to socialise, kill two birds with one stone. Choose your subjects wisely: The first step into the HSC is your subject selection. Scaling is definitely a plus, but it is unwise to think only of scaling – what’s the point of scaling if you hate the subject and you are going to do terribly in the HSC? That is a mistake that I made. If I could go back to the end of year 10, I’d restart this whole journey by adjusting my subjects. I’d recommend doing a mixture of what you like and what you’re good at. That way, you have constant motivation and you will reap good marks. Do an extracurricular activity: Doing an extracurricular frees your mind from all the studying that you have to do. Playing a sport or a musical instrument helps improve your health and mentality. Keep a journal: Write about any harsh emotions you are feeling, work that needs to be completed, places you need to go, etc. Your brain needs to be filled with the content regarding your HSC. Strong emotions will affect your mood and concentration, and prevent you from studying effectively. And if you cram too many plans into your head, you’ll find it hard to focus and remember things. Procrastinate: As much as you think it’ll be alright to push back an assessment, it won’t be alright. The further you leave an assessment, the more stressed about it you will get, and you lose your focus. Get things done. Lose sight of the goal: Keeping motivated every day is hard. But if you lose sight of that final moment when you get your HSC result and an acceptance letter to the course of your choice, it’ll be even harder to maintain your stamina. Write down your goal where you can see it and don’t lose sight of it. Get obsessed with studying: Yes, focus on studying, but don’t get so obsessed that you don’t give yourself time to relax and refresh yourself. Not only is it unhealthy, but it’s ineffective. Want to Ace English like Gemma Did? Book your free English Lesson today. Join over 4500 students who already have a head start like Gemma did. Book your free trial lesson today. Year 9 & 10: Maths Compulsory For University?